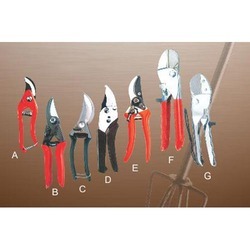 We deal in finest pruning secatuers. Our wide range of products can meet different needs of our customers. We are authorized dealer of most renowned brands. Great discount available for resellers. 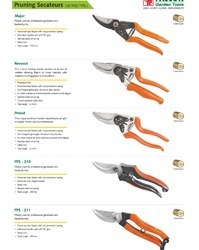 With an impressive growth record in this highly competitive industry, we are providing a qualitative range of Dyna Pruning Secateur. G1 (MAJOR)- FOR A CLEAN ACCURATE CUT: SECATEUR FOR THE PROFESSIONAL. P.V.C COATED SOFT CUSHION GRIP. Economy M-2 Mostly used by gardeners and horticulturists. • Hardened & Tempered steel blades. - Non-Stick coated high carbon steel cutting blade - 2"
We are engaged in manufacturing and supplying of a wide range of pruning secateur high cut for our esteemed clients. We are manufacturing these by using high grade raw material and hi-tech facilities to ensure high quality and longer life. These are stringently tested for quality before supplying so as to ensure that our clients get nothing but the best. Size 200mm, cutting capacity 12mm, brass anvil, easy lock and release, nickel chrome plated body, comfortable grip.